First off, all of us know what Craigslist is, right? Not to knock the premier commerce site of the century and universe, but it’s basic knowledge that everyone uses Craigslist. People post their services beginning from the very basic like ‘free stuff in the garage’ to high-profile copywriting, and everything in between. The site spans the whole world, too. Ask any employer out there when they’re putting an ad out for a job; Craigslist blows up the INBOX with countless replies after only one ad! That is, of course, a rough estimate, but look at it this way: several aspects from each site add up to make exactly what Zaarly is for you. 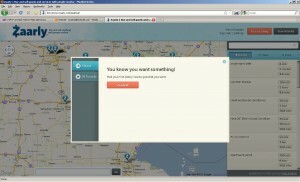 It’s like Craigslist in the sense that you can browse for things you might need in your area. However, you have the added benefit of a Mapquest feel with the built-in map and pinpoints of products or services people are offering. Essentially, it’s user-friendly — much more user-friendly than Craigslist, and that’s saying a lot. Moreover, the Facebook aspect is a sort of hip, fresh, fun, and even cartoonish feel, a brighter sense of community that’s more localized. And that’s where we get into the slight disadvantage, though: it’s more localized. You see, with commerce sites like Craigslist or even eBay, they span the globe. Zaarly doesn’t. However, for the most part, you end up looking for services or products that are close by to save on the postage of sending something or receiving something in the mail. But that’s all beside the point. In addition, check out the fun video! It’s a novel idea, this Zaarly thing. Why? I said it before, and I’ll say it again: it brings commerce to you, and not the other way around! First off, you get on Craigslist, and you do the browsing or posting. It’s more open-ended. 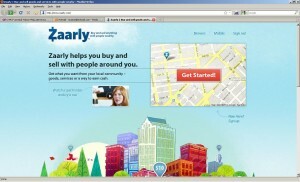 Zaarly, however, allows you the ability to see products and services immediately — without having to browse for it. That’s a sense of convenience for you. Now don’t get me wrong. Craigslist will be king probably for another century. But this warlord of frightening commercial power called Zaarly will be a heavy hitter for a long, long time. And, in my opinion, it won’t take long for this site to zoom past the king and overtake the throne. This entry was posted in Marketing, Sales, Small Business and tagged buying stuff online, commerce, Craigslist, internet, online, products, selling stuff online, services, Zaarly by Pierre. Bookmark the permalink.